Joke aside, the better the equity performance (in general as EPF did not fully disclose their positions) is, the higher the chances are for better dividend. Even though EPF should have snapped the position valuation based on close of last biz day of 2017, they always need to factor in slippage should they liquidate. Now we have 2 opposing effects. Equity in general is going up. But our USDMYR is going down (ie our ringgit strengthened). This is safer because you still can find the surface than that "Ice Lubang"
I think this is sea, not lake. Lake is fresh water. The surface water keeps on cooling till it gets frozen and float on water. The frozen layer act as insulator for the water below from the cold ambient temperature, keeping the water below warmer than surface, about few degree Celsius. Fortunately or unfortunately, in my not too younger days, I also met many of these "ignoramus" girls from sekolah jenis keb cina, in this blessland and in the small red dot. They ended up in their jobs not because they are lazy, blur blur or less smart, it is because of their impediment in the apanama language. Once you can't have a credit in spm, more or less ALL doors are closed (unless you got a rich daddy to send you somewhere else). They have no chance to smell ANY opportunities for further education established by your 1gomen like maktab perguruan or any other places enjoyed by the chosen ones. They also got no chance to smell any "better" job like become a lazy fat layer in a MNC because they are handicapped by their inggeris. So, man will end up as your air-cond guy, or your tyre mechanic, girl will end up in a bakery shop or hair salon, etc. THIS IS ESPECIALALY TRUE in the 80s, 90s and about less than 10 years ago. Now, such phenomenon is lesser because the birth rate of Chinese is low and generally parents can afford to give better things to the child/children but they are still many in absolute numbers.. I was in reality being a realist. We tend to forget that money in EPF is very sticky. it is just a number in a EPF statement until you finally withdraw all out. So what if the statement says you have 106K rm vs 108K rm; what is the actual amount you can withdraw immediately after EPF announce dividend? Hence corrupted or not the government vs needing money or not, announcing 8% vs 6% has almost no impact in "grand" financial sense. (pretend it is a fudging of accounts exercise). However, the positive perceptions by announcing a 8% dividend vs 6% are plenty. Current government looks good. Market perception of country's financial looks good. Population feels happy. I am super happy. Do not be overly pessimistic sir. Malaysia's financial situation while not perfect, is not that dire. We have plenty of things to offer to the world. Land and human resources are but two that CHINA or USA or SINGAPORE or THAILAND would love to own. regarding incompetent people, I unfortunately is a victim. I unfortunately also reports to a silly manager whose highest education level is form 5. Why is she my manager? Because she is super old, a yes lady and is stupid. Her boss likes it that way. Not a threat. 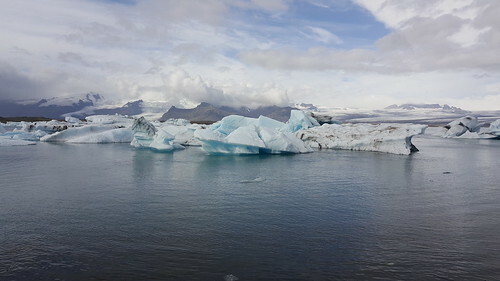 It is Jokulsarlon Glacier Lagoon, Iceland. Last week, a cab driver told wifey his monthly rental for a 260sqft flat is HKD18,000 (RM9,000) !! The rental is around 40-50% of his monthly income. Put aside the exorbitant rental, the blardy issue to me is the value of the money. It is just a 260sqft pigeon hole and chances are he cannot afford to own in his entire life as the selling price of HKD7million (RM3.6million) is beyond his affordability. Just have to keep on renting this pigeon hole with a rental that can easily rent a 5000sqft bungalow in Setia Eco Park or Country Height. yeah... rental is a function of affordability vs wage and in some sense would be influenced by minimum wage in some sense. used to live overseas in high cost cities and i think it is still better, when young and able, to earn a higher pay + suffer a bit (ie frugal) + choice to save money than low pay but no choise but to spend on necessities at one's home country. My ex-boss used to call this geographical arbitrage. Save as much as can and return to third world country called Malaysia! haha. eg: Take banking for example. Fresh grad in Malaysia earns around RM 3K in KL. NYC will be around USD 6K, but after tax say USD 4K. Living expenses in KL all in say RM 2K, leaving RM 1K savings. But NYC you can get a place for 2K usd, and spend 1K usd for rest and still save USD 1K. I am being overly generous here for rental because if one shares the apartment, suddenly savings is USD 2K => 8K myr. One can do the same in Singapore as well... or HK. But SG is easier to work because singaporeans are not as hardworking as HKers. 2decades ago i turned down a 2yr contract of HK50000/mth package (including believe it or not, a car parking bay at the office basement?) as the agency told me my bachelor pad luxe apartment rental will be like HK18000/mth...crazy. No way i will spent that % on rental. Lifestyle or not...I dont need no wmimming pool, gym and whatnot...Gimme a hammock under 2 palm trees, a pail of chilled beer and I am contended. That is about right, a 1,100 sf apartment is Sheung Wan, HK rental is abt HKD35,000.00 pm. Take it or leave it if you do not like it. This will give an annual gross ROI of 2.05%. The net ROI is likely less than 1.8% after taking into consideration of other costs like borrowing interest, tax and maintenance !! In Wimbledon, near London a 1,500 sf terrace house ( now cost about £1.1m) rental is abt £1,800 pm. This will give an annual gross ROI of 1.96%. The net ROI is likely less than 1.6% after taking into consideration of other costs like borrowing interest, tax and maintenance !! Wonder why the f to invest in such place (except for the price appreciation, hopefully)... !! Sorry the earlier figures that were given is out of date. Rental for that 825 sf Shad Thames apartment is £2,300 pm. I am not sure about the ROI of fixed-income instruments in UK, can't say whether the rental yield is acceptavble vs the fixed-income instruments. The rental for a 2000sqft high-end condo in SJ is around RM3500. The market price for such condo is RM1.2million. The gross ROI is 3.5%. Again, I don't see much room for further appreciation of the condo price (original price was about RM650k, 10 years ago). FD rate in most banks are above 3.5% now, it is not uncommon to get 4.0-4.2% preferential rate. Personally, property is just a long term hedging instrument against inflation. According to Epf Ceo, their investment policy is to pay 2% higher than inflation rate. So far, they are able to pay average 3.5% higher than inflation rate, and this trend will continue for 2017 dividend payout. BNM's inflation number is between 3.0%-3.5%, latest number in November is 3.4%. Wonderbar! 1% over the last figure bantered... That's 5 digit extra! Bring it on!